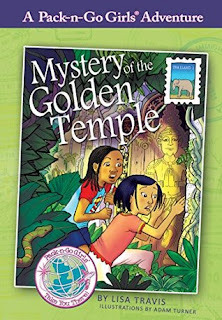 Mystery of the Golden Temple follows Jess Johnson, an nine-year old African-American girl traveling with her mother and brother to Thailand. Jess is paired up with Nong May, the Thai daughter of her mom's colleague, and the story follows their early mishaps and adventures. This was a delightful book and a quick read. At right around 100 pages and 10 chapters, it is a great fit for the emerging reader looking to move up from young fiction or easy readers into longer middle grade fiction. There's an illustration every chapter to help with comprehension too. I really appreciated the diversity-focus of the book. The story does a great job of including culturally-specific details about Thailand and the Thais language in a way that is engaging and relevant to the story. There is a pronunciation guide and glossary in the back, and the character often provide pronunciation tips to each other in context as well. This story is the first in the Thailand-based mini-series of books by Pack-n-Go Girls. Other mini-series star different characters and take place in Austria and Mexico. Pack-n-Go Girls is currently in the midst of a Kickstarter campaign to raise the funds for the next series of Pack-no-Go Girls books, slated to be set in Brazil. You can read more or donate to the Kickstarter campaign here. This is a great series to get girls interested in travel and exploring other countries. I will definitely be picking up more of these for my classroom! Thanks, Julie. Yeah, I am also really impressed with the execution of this series and their commitment to diversity in characters and in cultures.